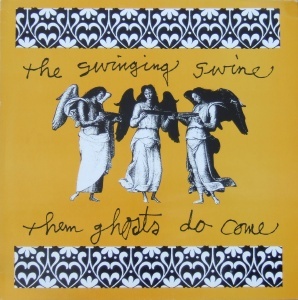 The Swinging Swine were formed in Galway in 1986 by Eamonn Dowd (ex New Testament) and Doug Steen. Both were art students in Galway. Doug was a sculptor from Cootehill in Cavan, Eamonn from Claremorris in Mayo. The lineup was completed by Joe Wall (bass) and Seamus Sullivan (drums). 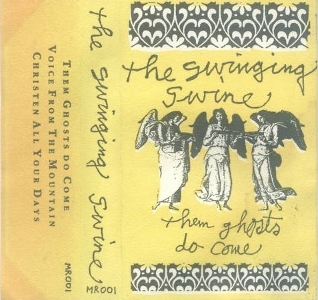 This band gigged regularly across the West and recorded a 3-song demo in 1987 (there is also reputedly a homemade video for one track "She Said"; other tracks include "Bone Dry In Babylon" and "Price You Pay"). 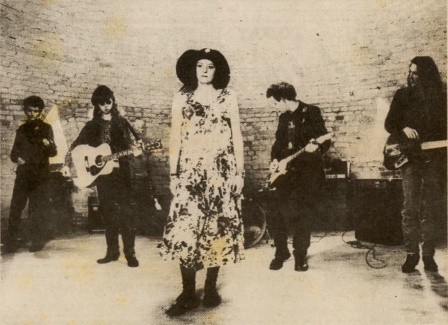 They added singer Joanne Loughman from Manchester, who'd come to Galway to study, and as Joe Wall was committed to The Stunning, they recruited new bassist Peter Murphy. The band then set off on the "To Hell or to Connacht" tour of the West before relocating to Dublin in the autumn of 1987. Once in Dublin, the lineup expanded to include Hugh O'Carroll (fiddle) and John Lalor (bass) and they began the quest for a new drummer. Among the many contenders was the ubiquitous Sean Ryan (Crime of Passion, The Candyshop, Echoes of Pink Whispers, Honey Thieves, Peach), who was (briefly) a member of the band, and Bernie Walsh (Stars of Heaven), who played some gigs and did some TV appearances but never officially joined. The expanded lineup were described (rather inaccuratley) in Hot Press in 1988 as "mundane Waterboys influenced country rock". 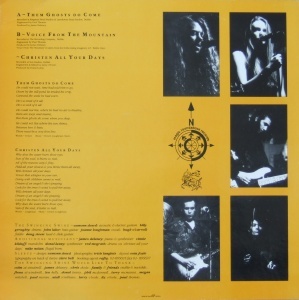 They were lumped in with the raggle taggle bunch because of the hippy image, the fiddle, the acoustic sound and the roots music influence, but there was more than a hit of neo-psychedelia about them and they would've fit in nicely in the 4AD scheme of things. The aforementioned TV appearances included RTE's Borderline in 1988, where they performed "Them Ghosts Do Come" a full 2 years before it's acutal release, and one one song. The also appeared on Windmill Lane's Check It Out TV Special recorded at the Olympic in Dublin in 1988 and recorded a Fanning session for RTE Radio the same year. 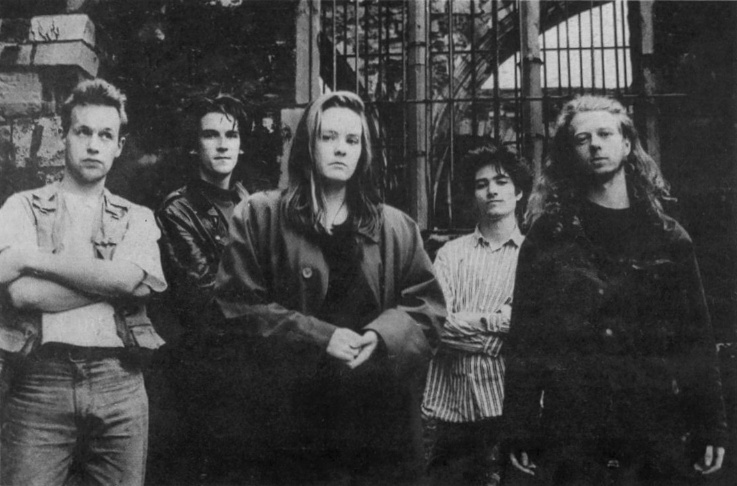 Though based in Dublin the band concentrated on building a following by playing regular gigs in places like Walters and the Purty Loft in Dun Laoghaire. This built a buzz around the band so that when they did play city centre venues, the gigs were packed. 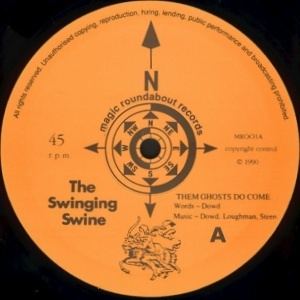 The Swinging Swine eventually built up a huge live following all around Ireland. With no releases under their belt it was harder to get gigs in the UK, where their exposure was limited to events like the Irish Rock Week at the Mean Fiddler in London in the spring of 1989. 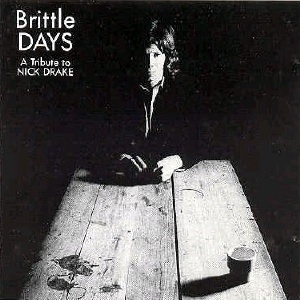 Even so they were invited to contribute to a Nick Drake tribute album by the tribute album specialists Imaginary Records in 1989. The band chose "Voice From The Mountain" and the album finally came out in 1992 titled "Brittle Days". When Billy Geraghty responded to a drummer wanted ad in Hot Press in 1989 and travelled from his home in Galway to Dublin for an audition in Litton Lane, he became the bands tenth (in four years!) and last drummer. The band was recording lots of demos and was really keen to release a single in 1989 but were advised against it. There were other bad management decisions which hampered their progress. Finally a self-released EP was planned for 1990. It was recorded at various studios in Dublin. It contained the live favourite "Them Ghosts Do Come" and the Nick Drake cover "Voice From The Mountain". Both were engineered by Paul Thomas (U2, UB40) and produced by James Delaney (Clannad). A third track was done by Donal Lunny. Billy had to borrow a drum kit from Paul Moran (then drummer with Clannad) as his own kit wasn't up to the job. The EP sold very well in Ireland and was a surprise top 40 hit in the summer of 1990. The band split. Joanne Loughman & Hugh O'Carroll were later in The Glee Club (on Setanta and 4AD Records). 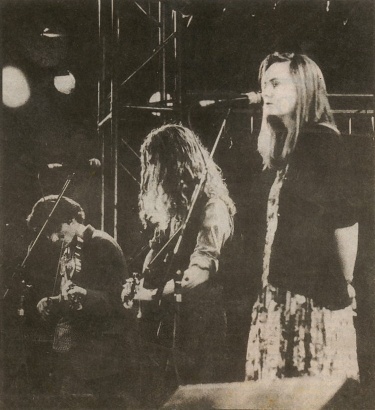 According to their 4AD press release, it was the tension between this duo's neo-psychedelic leanings and the rest of the bands more trad/celtic folk rock approach which led to the Swinging Swine split, but in fact the band had numerous musical and personality clashes and was not unique in this regard of course. Billy Geraghty played drums and percussion on the early Glee Club demos. Eamonn Dowd has fronted Eamonn Dowd & The Racketeers for several years and currently lives in Sweden. He is the subject of a documentary film Deal With Yourself, scheduled for release in late 2015. 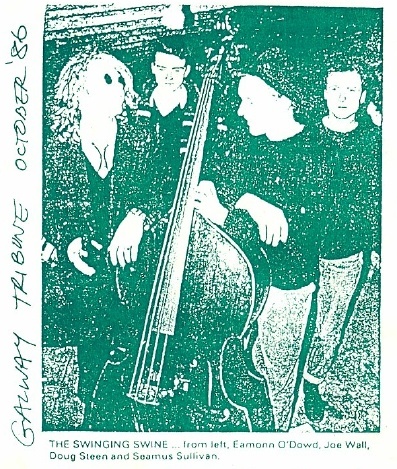 Billy Geraghty went on to work with Interference and Hank Halfhead and the Rambling Turkeys and later became a London based tour manager and roadie (driving The Divine Comedy around Europe at one point) before ending his playing days with a jazz band in Galway in 1997. In 2000, an earlier, previously unreleased version of "Them Ghosts Do Come" was used in the soundtrack to a low-budget Irish independent film about a drug dealer (how original!) 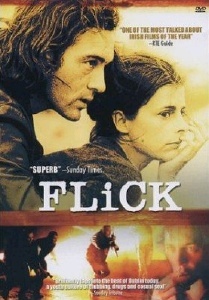 called "Flick". 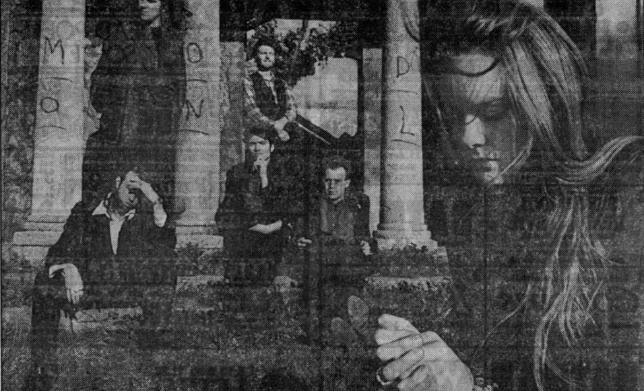 There are many unreleased songs including the wordless "Zebedee", which inevitably drew Cocteau Twins comparisons, "Temple of Love", "Brown Rabbit", a.o. More info about this band needed please. This EP entered the Irish top 40 on July 5th 1990 for a 3 week run, peaking at #30. There was no 7-inch edition. Featuring guest contributions by Vinnie Kilduff (mandolin), Donal Lunny (synth on B2), Red McGrath (drums on B2) and Mike Nolan (flugal horn). A promotional video was made by Dave O'Donoghue.